LG Electronics unveiled its new stylish LG G Watch R, its latest and greatest smartwatch running the Android Gear operating system, at the IFA consumer electronics show in Berlin today. The LG G Watch R’s 1.3” full circle 320 x 320 plastic OLED display utilizes the entire face of the watch for a more classic watch appearance, unlike the rectangular LG G Watch. Inside, a 1.2GHz Snapdragon 400 processor, 512MB of RAM and a 410mAh battery power the G Watch R.
On the outside, the LG G Watch R is framed with stainless steel and comes with a 22mm calf skin leather strap. The device is waterproof to the IP67 standard, allowing it to deliver notifications and monitor your pulse even when submerged in a meter of water (for up to 30 minutes). The LG G Watch R will be available for sale in the U.S. “in the fourth quarter of 2014,” with price and availability to be announced at launch. 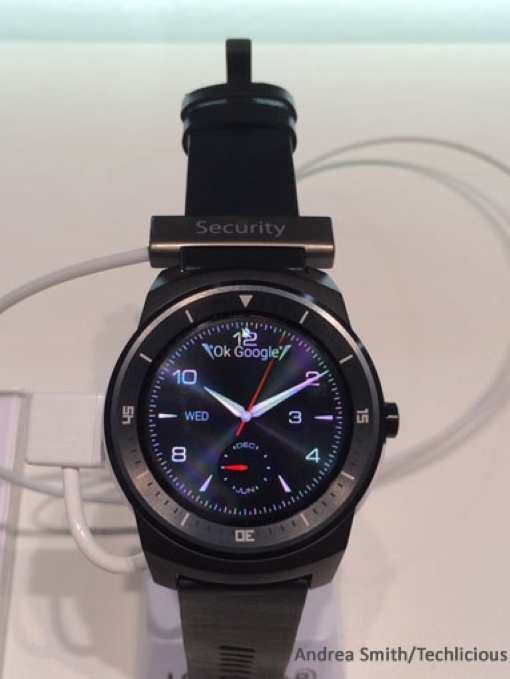 For more on this attractive smartwatch device, check out our short video below.